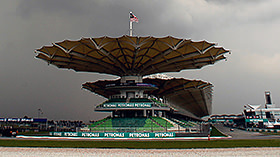 The second of two ninety minutes sessions will be completed around the Sepang International circuit today, with drivers testing out (weather depending) the medium and hard compounds. Make sure you get a good look at the sidewalls, and note whether you can tell the difference between the silver and white stripes. Equally, keep an eye on any teams bringing new and unusual parts to their cars this early on in proceedings.